Was I excited to try these? You *BUTTER* believe it (that’s a popcorn joke btw, because I love popcorn, and truffle popcorn is probably in my top five snacks of 2018. If I start a new site in the future, maybe it will be a popcorn review site). But before I get into my commentary about the quality of the actual chip, I have to comment on how I missed one fatal flaw upon purchase. For those who follow along with The Chip Review (thank you, very cool!) you might already know where this is going if you look closely at the photo above. Trader Joe’s has introduced the SAME despised bag-opening technology as Kettle Brand. And here I am, struggling trying to stop the spread of a terrible idea. I have contacted Trader Joe’s about the error of their ways, and I urge you to do the same. Let them know this type of behavior is not acceptable. The good people of the internet have complained about this functionality for years ever since Kettle introduced it. There are YouTube videos mocking this technology. People are angry on social media about it, tweeting feverishly at Kettle Brand and other offenders. But here we are, the concept still spreading. A bad idea is getting legs, and influencing other brands to adopt the same technology in the name of innovation. But nowhere does the word “improvement” appear in the dictionary definition of innovation. No, it simply states “the introduction of something new.” New and good are not synonyms. Please, Trader Joe’s, fix this mistake before it spreads to your other snack bags. Alright, with that being said, onto the flavor of a truffle chip. My initial reaction when crunching into the first handful of chips was… a surprise. I can’t say I immediately fell in love with the flavor at first. But a couple of bites later, it grew on me. I am a simple man with simple flavor preferences, so perhaps it took my basic palate a short period of time to adjust to an advanced profile. 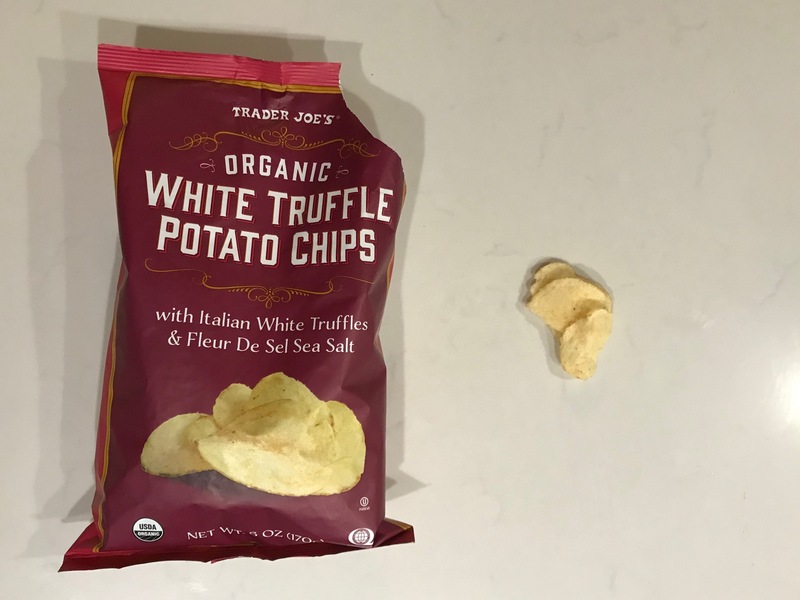 I appreciate the experimental nature of the white truffle on a potato chip, but they could perhaps use a little more salt. I want my mouth dry after eating a half bag of chips, and these didn’t do that. One more gripe that I almost forgot to address because of how angry I was to see the slit-opening technology at the top of the bag. This bag had a ton of air in it, too much, to be honest. I felt a little robbed, like someone broke into the house and maybe stole a few moderately priced items, when I felt the air to chip ratio in this bag. Overall: I recommend trying these if the flavor piques your interest, and especially if you own a pair of scissors to circumvent their terrible bag-opening technology.